Sally had done it now. With one step of her little black paw on the front door lock, she had locked herself inside the car, and worse of all, had locked me out. To make matters worse, the engine was still on, and now in this new found situation, my fear and anxiety had turned on, too! What a sight we must have been. An excited little puppy pouncing on the inside of the door, looking out the window at me, while I stood there, a helpless grown adult, looking in at her! It had all started when I decided to stop and check my mail at the group of mailboxes located at the end of our cul-de-sac. It was mid-July. With temperatures over the 100 degree mark, I had opted to leave the car running with the air conditioner on. I hopped out of the car, with only the mailbox key in my hand. When I returned back to the car and reached for the door handle, Sally excitedly jumped up on the door to greet me and had inadvertently created a chasm as deep as the Grand Canyon between us. What could I do now? Pray, of course, and pray I did. Instantly, the thought came to me. The key to unlock the door is right in your hand. But as quickly as this thought had come, doubts had come, too, rising to the forefront of my mind, drowning it out. That key will never fit in the lock for the car door. It's just a mailbox key. Why sometimes it's even a struggle to get it to fit in the mailbox lock. Open a car door? Nope, it will never work. I decided to walk around the car and check the doors and windows. Maybe I would find one of the other three doors had been left unlocked. Perhaps a window might be opened just enough to aid me in solving this unfortunate dilemma. But, after checking each door and window at least twice, I was the one still standing outside the car, anxious, frantic and hot, while my puppy was the one on the inside, calm, cool, and collected. Repeatedly, the same thought, The key to unlock the door is right in your hand, kept trying to push it's way through the crowd of doubt and self-reliance flooding my mind. Ridiculous. Absurd. It will never work. There has to be something else I can do. But what? What could I do? I kept trying to think of a way to get into my car, while stubbornly refusing to listen to His still small voice. Finally, after what seemed like an eternity, I decided to "give in" and try the mailbox key. After all, what would it hurt? I could at least try to use this key to open the door, couldn't I? So, slowly and almost reverently, I inserted the mailbox key into the keyhole........and it turned. The door lock popped up and the wall between Sally and I came tumbling down. How I could have saved myself these past minutes of tension, frustration and sweat! The answer to my problem had come as soon as I had prayed. The Lord had been faithful to send help the moment I had needed it. I was the one who delayed. I was the one who hindered His assistance by my pride and a spirit of self-reliance. 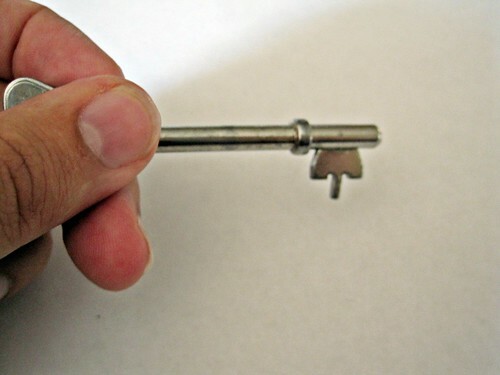 Truly, the key to unlock the door had been right in my hand the whole time. How often we come face to face with locked doors in our lives. A rejection by a spouse. A pink slip from our employer. A rebellious child. A life threatening illness. We see no earthly way of unlocking this door, so we stand helplessly on the outside looking in. We plead with God to help us, and when His answer comes, we choose our own solutions which seem more logical, and more reasonable, only to find they are unsuccessful and futile. God whispers His direction and guidance time and time again. The key to unlock the door is right in your hand. And so it is. For God has given to each of us a measure of faith, and it is faith alone that is needed to unlock these doors in our lives. A few weeks later, my curiosity got the best of me. I kept wondering if God had truly worked a miracle in my behalf, or if that mailbox key was just similar enough to that of the car key that it had worked when tried. Once again, with the same reverence as before, I slowly approached my car and tried to insert the very same mailbox key into the lock. This time, to my surprise, it wouldn't even begin to go in the lock, much less unlock the door. But then again, why should it? That key, after all, is just a simple mailbox key whose only purpose is to allow me access to my mailbox so I can retrieve my mail. Nothing more. Nothing less. Faith is what unlocked my car door! Way cool Stacy! What an awesome and amazing God we serve meeting us and caring for our needs right were we are at. What a wonderful testimony! It is so awesome how God cares about every detail of our lives. What love. Wow!! How cool is that??!! Praise God!! Isn't awesome how He hears and cares about everything in our lives! First time visiting ur blog, I will visit often.